van Helsing is pleased to announce that its Managing Director, Dr. Janet Wademan was awarded the Chancellor's Medal at the University of Glamorgan on the 19th July 2001 in recognition of her distinctive contribution to Enterprise and Wealth Creation in Wales. Lord Crickhowell, a former Welsh Secretary . Pro-Chancellor, I present Janet Wademan to congregation for the award of Chancellor's Medal. Dr Janet Wademan was born in Llanelli, and has spent much of her life in and around Cardiff. She was awarded BA and PhD degrees in pure mathematics from the University of Wales Cardiff, and is a Member of the Institute of Management. Dr Wademan joined Ferranti Computer Systems Ltd as a software engineer, and developed software for a wide range of military applications on board warships. She progressed rapidly within the Ferranti group, managing projects involving emerging technologies, including Virtual reality, in a wide range of applications. Dr Wademan's overall aim was to work in technology marketing and business development, and as her career developed she played a leading role in major technology-led international projects, maintaining her view that she was "not in technology for technology's sake", but concerned with the benefits that the technology could yield. Towards the end her 14 years at Ferranti, her fast-moving career led her to become Aide-de-Camp to the Director and General Manager. The job of CEO of a major international firm involves a great deal of travel, so the post of ADC effectively put her in charge of the day-to-day management of the company. This gave her a very wide experience, and was a period of her life that she obviously enjoyed even more than ever! When the firm went into liquidation..................(perhaps I should explain that the well-publicised failure of this firm was not an operational matter but caused by serious fraud, and Dr Wademan was quite blameless!! )..........., after a short spell managing a huge project for GEC she and her husband formed their consultancy firm, van Helsing Ltd where the philosophy of making appropriate use of new technologies was retained and reinforced. This name incidentally comes from Dracula, Bram Stoker's great work, and refers to the doctor who was called in to solve difficult technical problems. In any case, the company specialises in providing strategic marketing advice to high technology companies in ICT, telecommunications and engineering, including providing specialist expertise in European funded projects. These have included bringing technology focused economic development to Wales, advising a multi-national team on the sale of Eurofighter jets to a foreign government, and advising on design, development and production of secure tactical wide area communications networks valued at £100M+. Dr. Wademan has spent many years promoting Welsh industry and Wales globally, organising the Welsh presence at a number of well-known international events. At present she is leading a European consortium developing a web-enabled software tool to help sustain rural industry. Dr Wademan serves the community more broadly as a Director of the Gwent Health Authority, a role in which she also provides advice on the adoption of ICT. She chaired the inter-agency Year 2000 Planning Group, which put in place measures to ensure business continuity in the health sector and allied disciplines over the Millennium period. She is also the Chair of the Audit Committee, which she uses as a vehicle for continuous process improvement. Despite these professional demands, Dr Wademan maintains an active personal life. She was a member of the National Youth Orchestra for Wales 1971-76, and has directed a production of "The Mikado". Dr Wademan is a Member of the Society of Genealogists, and has been Chairman of the Gwent Family History Society. She has also been a Role Model for the Engineering Industry Training Board, the "Understanding Industry" scheme and Mentor to the South Wales Police Force's "Business in the Community" initiative. 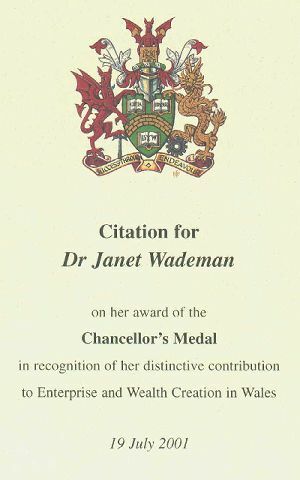 In recognition of these wide and high achievements, Dr Wademan was awarded the title Welsh Woman of the Year 1999, in the Science and Technology category, and we are pleased that she has accepted our invitation to become an External Professor in the School of Computing of the University of Glamorgan. Dr Wademan has clearly demonstrated high level of achievement in business and has contributed to her community in various ways. For all these reasons this university is delighted to present her with the Chancellor's medal. After the Citation was given by Vice Pro-Chancellor Professor Michael Connolly, Mr Tim Rees OBE, Chairman of the Board of Governors officially awarded the Medal to Janet on behalf of the Chancellor, The Rt. Hon. the Lord Merlyn-Rees of Cilfynydd. Janet then took the opportunity to address the congregation firstly to thank the University for the honour before paying tribute to all the hard work undertaken by the graduands, recognising the support of families and the dedication of the staff at the University. She concluded her speech with a request to those students staying in Wales to work together to make Wales a better place for everyone and to those leaving, her hope that Wales has a special place in their hearts and that they'll always be ambassadors for Wales.